Its been a while since I posted but past month has been completely crazy with trips within and outside the country. Personally, I prefer spaced out schedules, me-time and a slower pace but well,at times that’s just not a possibility! After the Yoga retreat, Frankfurt and Paris beckoned and I must say I was very impressed with the commitment to healthy lifestyles there. There was such a great choice of salad bars, fresh sandwiches, fresh fruit juice bars et al ( I would walk down daily from my Frankfurt hotel to the mall across just to grab a huge jar of freshly chopped fruits. Four times a day!). In the evening, post 5 pm , the roads and plazas were busy with locals cycling, skating, running, skateboarding, walking the pet- basically being very active. I guess here in India, we are starting on that path, at least in the Metros, but weather and infrastructure can be such a letdown at times!I do hope some nice, hygienic fruit bars would crop up soon though. Sounds delish, eh? I couldn’t wait to try ’em bars! When I received the product samples from them, what really piqued my interest was the gorgeous, spicy fragrance the pack left in my hands! ( And I had yet to open the outer wrappings). As I tore gently unwrapped the bubble pack, there were two delightful variants in there – Rose, Geranium & Pomegranate Bar in a pretty pink pack and a Neem, Basil & Tea Tree ( Anti Fungal & Anti Bacterial) one in a fresh green. And that heavenly aroma! So when NL asked Bhuvana to elaborate on the benefits of natural soaps vs commercial soap brands , she explained that ” People who have ever used handmade soaps swear by it and prefer such natural soaps compared to the commercial soaps. This is because of multiple reasons, apart from the key benefits of natural ingredients vs dangers of chemical ones. Glycerin, a natural byproduct of the soap making process, is retained in natural soaps for maximum moisturization, whereas in commercial soaps, the glycerin is removed and sold for making lotions, creams and other cosmetics. Further, natural soaps, many a times use essential oils for fragrance and natural coloring agents, which add to the reasons why natural soaps are a better choice. 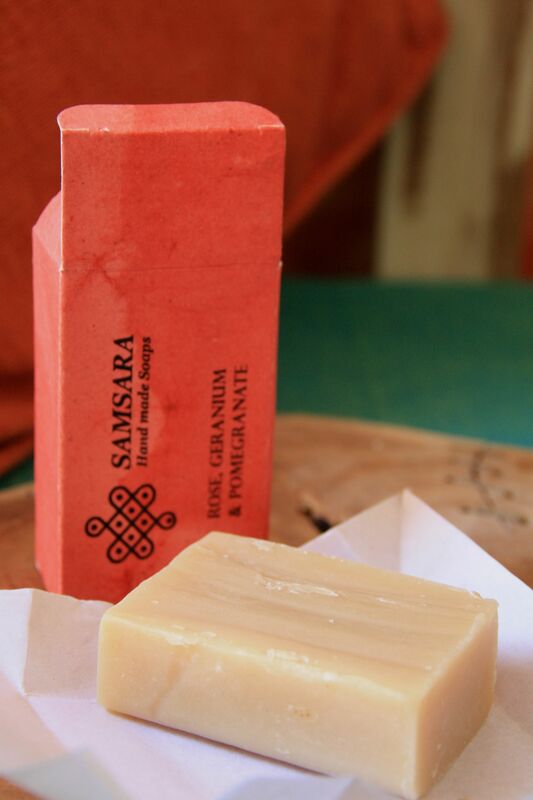 Also, the cold process used for making the soaps uses the natural heat produced in the process of making soap and takes longer to dry and harden, thus retaining maximum benefits of the natural ingredients. If you’ve used handmade soaps, you will know that one stroke of the soap against the wet skin is enough to build lather while with commercial soaps, you need to apply much more. This one is a delicate, luxurious cleanser with a very heady, natural fragrance. I loved the gentle, dreamy romantic imagery its overtones of Rose and Cinnamon fragrances generate!While Rose derivatives are THE hottest trend in the natural beauty industry, Pomegranate seed oil is known for its anti-ageing properties. On use, the soap did not try out my skin and rather, softened the skin more. 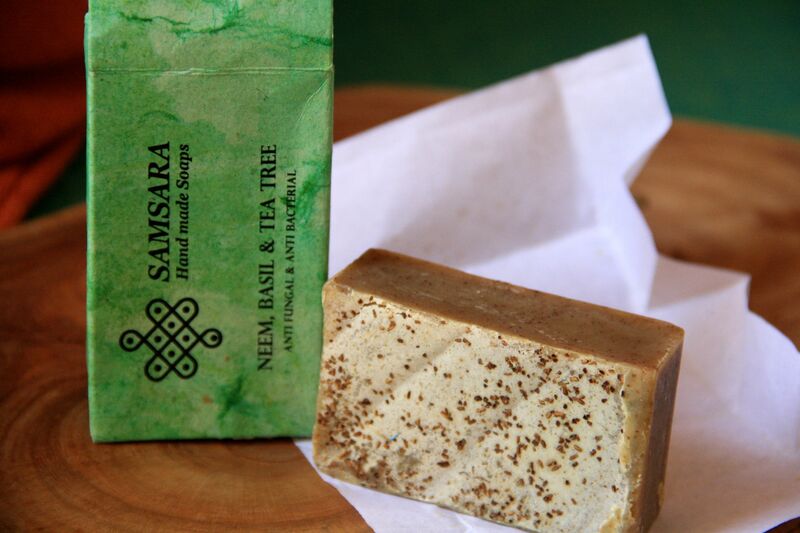 Regarding Samsara’s Neem, Basil and Tea Tree with Anti Fungal & Anti Bacterial properties, I thought it was a great option in this summer heat and also if one has any mild skin issues.With the known medicinal benefits of Neem, Basil & Tea Tree and exfoliating properties, its a soap I would like to have around for use every now and then. It has a naturally clean, fresh fragrance. The best part is the products have a certain softness to them, lending a luxurious touch. 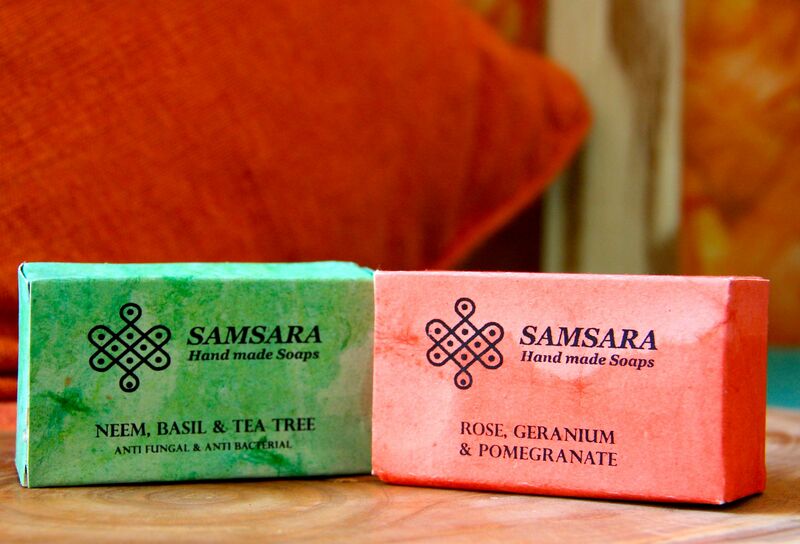 They are moisturizing, and as far as natural products go, truly divinely fragrant. Also, being handcrafted and hand cut , no two soaps are the same and have that ‘ all natural’, rustic feel with all the goodness of nature in them. and on world-wide-web I found this web site as a finest web site for latest updates.